11 entries categorized "Art humor"
5. Add a couple of rooms to my studio, including a wet studio for painting and dyeing, plus a large, climate-controlled storage room for the finished work that's piling up. Adding extra rooms might be a problem, however, since my studio is in the basement. Maybe I could dig a secret tunnel through the wall using a sharpened spoon and carve out a few underground caverns. 9. 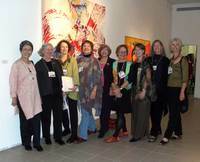 Be discovered by a Big Name gallery owner or museum curator. I want to be the hottest ticket on the block, right after Jeff Koons and Grandma Moses. Offers for solo shows will rain down upon my shoulders and I will need to hire several cute young men to assist me with my paperwork. My work will sell for millions of dollars. Hey, it could happen. I use a lot of different materials in my artwork. The problem with this is that I collect a lot of odd items which I'm just sure I'm going to use someday. Walnut shells - Several years ago, I saved the shells from some walnuts we were eating. Notice that I even wrapped red rubber bands around them to keep matching halves together. I have yet to figure out a use for these, but I have faith that someday I will. 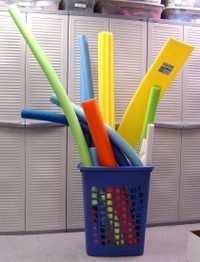 Foam pool noodles - These are my favorite things to play with (except for fabric). I like to have a handy supply available and use them frequently in my artwork. 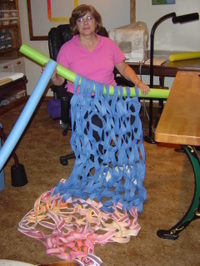 Mostly, I use pool noodles inside of my sculptural pieces because they are easy to carve, lightweight (which helps with shipping costs) and inert, so they will not chemically break down after a period of time. Some of the finished works where I've used these noodles are Knitted, Forest Floor (the mushrooms), Tethered and Transformed. I also used to keep foam pipe wrap, of the type used to insulate water pipes, but my husband came down to my studio one day and asked if I had any. I replied, "What size and what color?". That's when I knew I had gone off the deep end. Plastic mesh - I have such a large box of plastic mesh that I didn't even photograph them. They come from vegetable and fruit bags, but the biggest are from gigantic 50 lb. bags of peanuts that we buy for feeding the birds. I used some of these in an older work of mine called Premature Robot. Cardboard corner protectors from picture frames - OK, I threw these out recently, but I kept dozens and dozens of them for a very loooooong time. They would have made awesome plates on the back of a stegosaurus (if I had some inclination to make one). There were so many that, if I had done this, my studio would have resembled an overcrowded Jurassic Park. Metal springs - Why? Then again, why not? Giant snail shells - They were originally purchased at a gourmet food store and intended for escargot. I sold the extras a year ago at an artists garage sale, but they lived in my studio for several years, mocking me. I still have the can of snails around here somewhere because no one wants them, despite the $18 cost. Believe it or not, I really did use them in my artwork Forest Floor. As I was using a Dremel tool to drill holes in the edges of the shells so I could sew them down, my son came into the room and asked what I was doing. I told him I was quilting. To his credit, he just shook his head and left the room without making any comments about his crazy mother. Tape reels from old computers - My husband brought one home from work because they were being thrown out. I convinced him to go back and dig another one out of the garbage because I can really see a very long, skinny quilt rolled up on them some day. I'd say that this was a throwback to my days at IBM, but the computers I supported didn't use tapes. Corks - I've been saving these for years and someday I'll figure out why. By now, you should be getting the feeling that some of my artwork would probably float on water. And it would. 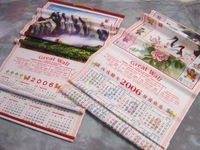 Chinese restaurant calendars - These cool 2006 calendars were giveaways from our favorite takeout place. They are made of plastic and roll up like sushi rollers. They would make an interesting texture when I was stamping something, but not for use in the main body of a quilt. The takeout place might get orders from some unusual locations if I did. One Minimalist to leave the old bulb in place. One Romanticist to light a candle, providing the right atmosphere for changing the bulb. One conceptual artist to write out instructions, so others can create the actual bulb-changing process for him. One Surrealist to use a fish mouth to unscrew the bulb. One feminist artist to smash the bulb because it looks too much like an erect phallus. One Abstract Expressionist to strew the broken glass around the room. One performance artist to roll around on the glass, videotaping the look of pain on his face. One installation artist to sweep the glass pieces into piles of various sizes. One assemblage artist to attach the broken glass to a wooden pole. One graffiti artist to tag the glass with spray paint once the pole is installed outside. Plus one janitor to put a new bulb in the fixture, so he doesn't get fired. As much as I'd like to think all my work is amazing, I've had some truly awful "going down in flames and it's time to jump" failures. At least I recognized these disasters before I sent them out into the world for others to see. Here are some gems that have never seen the light of day before. It's my very own House of Horrors and I'm showing them to you now to prevent future blackmail scenarios. This beauty was originally going to be called something like Encased. There is a vinyl sack attached to a green fabric base. The base has a hole through it so something can be inserted into the sack, then a second green base covers the hole. The "something" was a long, skinny quilt that was crammed inside. 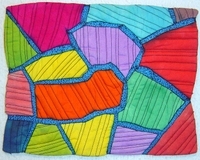 Another stunner is this small quilt, which is about 8" x 10". I was never able to figure out what to do with it. It's just there. 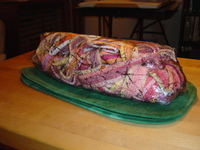 About the best thing I can say is that it's colorful and would make a good potholder, if it matched my kitchen better. 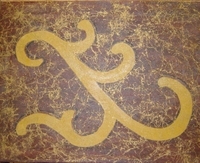 When I create a framed work, I usually paint on a stretched canvas, then use fiber art techniques to finish the design. Here is another work that was going nowhere fast and if you don't like this one, I can show you several more that are just as bad. I typically hold onto these bits of unfinished projects, terrible or not, because I've been known to recycle them into newer work. In fact, the pink skinny quilt was originally part of Tethered, until I realized the quilt was twice as long as it should be and chopped it off. After an unsuccessful trial run in the meatloaf, that chunk of quilt finally ended up in Knitted, proving that a spectacular failure can sometimes turn into something quite spectacular. Anyone want to buy an empty vinyl sack sitting on a green platter? You create installation art that typically contains thousands of pieces and is obviously influenced by the Op Art movement from the 60s. You love to make gallery owners squirm, wondering how thay are going to clean up after your exhibit is done. Frankly, you really never thought about it much. Your mom always cleaned up after you, so why shouldn't everyone else? You paint watercolor landscapes, preferrably scenes of peaceful places copied from magazine photographs. Your favorite colors are blue and green, but you'll occasionally go wild with an accent of brown. You're not really satisfied working in this medium and style, but it's how you got started as an artist and you are determined to enjoy it, no matter what. Your landscapes are starting to look a lot alike but you hope that might change if you move the lake to the right side of the paper, even though you have always put it on the left. Your art is difficult to categorize because it can take so many forms, but it probably has something to do with words. You ask for a lot of help from your friends, but conveniently forget to mention their names when it's time to hand out the credit. The social butterfly of the art world, you'd rather chat with people at opening receptions and write items like this for your blog than actually go into your studio and make something. Fiber art is your medium because you love the soft flowiness of the raw fabric and yarn. You only wear naturally-dyed garments made in your own studio, which used to be the old woodshed on your organic farm. Sandals are your footwear of choice, summer and winter. Local tourist trap stores sell your work at inflated prices and the proceeds allow your Signifibant Other to keep the ashram open. You make really big sculptures. If you can lift them with anything less than a two-ton crane, they're not big enough. Heavy metal and large boulders are right up your alley and anything less is wishy washy crap. You like being the person who directs the foundry workers and the installation crew. Damn, but you're good! You are a museum curator because you prefer a more secure source of income. You like being able to pick and choose all of the artwork displayed because you want to be sure that it is up to your usual high standards. Despite a penchant for the Old Masters, you occasionally display some of that contemporary stuff if you have to. Museum visitors are a necessary evil, because they require a lot of your time and you already have lots of tasks on your list for today. Artists can be even more bothersome. You love to create ceramic teapots that are decorated with mythical animals. As you work in your studio, you listen to Jane Eyre on tape to get you in the right mood. You are torn as to whether you should sell your work, but all the friends from your volunteer job think you should. However, you've never been good at negotiating with gallery owners and you were suckered once before, so it hasn't been your highest priority. You make shrines from found objects, but you don't usually show them to anyone. One day, after you're gone, someone will discover your work and your name will become even more famous than those jerks who always told you that you're not good enough. You spend a lot of your free time hunting through streets, alleyways and trash cans for raw materials. The things you find are kept piled in boxes, which overflow onto the floor of your studio because you just can't pass up a good piece of junk or scrap. You design cutting edge anime. The style really appeals to your good side, which believes that, by the time you get to the last page, the story should alway get wrapped up in a happy ending, with the hero beating the bad guys. A lot of your art gets thumbtacked to the wall of your rather messy studio apartment or shown to your college buddies. You haven't had your hair cut in quite a while and it keeps falling over your face, hiding one eye. You create meticulously carved duck decoys, but sometimes you like to sneak one in that looks a little bit like Daffy Duck. You plan to sell your work at outdoor craft festivals, which is why you've spent the past three years making meticulous plans and researching the market before entering your first show. Even after all that work, you're not sure you'll have much success. In the meantime, you attend the decoy carvers convention every year so you won't disappoint your friends, who expect you to be there. You learned how to create computer-manipulated digital prints as part of your engineering job. You work in your basement studio, where you installed several banks of computer equipment, including some big honker printers. You generously share your artwork with the world through your website but you use a pseudonym instead of your real name so they can't track you down. As a pastel artist, you specialize in children with oversized eyes, baby animals and vases of flowers. Still life drawings are your favorites because you really get upset when your subjects start to move. Mostly, you give away your pictures to your friends and relatives but when you visit them, you have the uneasy feeling that they hung your pictures moments before you arrived and other pictures normally hang in those spots. There are different types of visual artists and what you wear should reflect the artistic milieu to which you aspire. Here are a few pointers to get you started. Above all else, you need to show your disdain for the rest of the world, because no one else "gets it" the way you do. Clothing should include jeans left over from high school and a message-heavy tee shirt. Be sure to wear some evidence of your medium, like a spot of paint or fleck of sawdust. If the clothes have been recently washed and contain no more than one hole per ensemble, you can wear these clothes to fancy dinners, too. Hair should be uncombed and rather dirty, which makes additional styling gel unnecessary. Choose at least two neon colors and streak them through your hair. Curl your lip and look disgusted to show your parents you are on the verge of being discovered for your genius, even though you live in their basement. Goth is a good look as a starting point, but layer on a few strange items to tell the world who you really are. Bonus points if those items are not normally used as clothing. Whenever you go to an opening reception, wear something that you made yourself. It can be a purse, vest, or poncho style garment, intended to hide those postmenopausal overcurves. Look for slinky travel knits that don't wrinkle Threads on your shirt are always an elegant touch. Be prepared to discuss the surface design techniques that were used to make that garment while you are waiting in the Ladies Room line for the next available stall. Hair can be left gray or colored. Casual wear includes stretch knit pants with an elastic waist, comfortable walking shoes and solid color tee shirt in a pastel or neutral color. The purse must be black, with lots of zippers and compartments. Same as for The Cutting Edge Art Student, but lose some of the hair. Choose your easel wisely, as it will be your main accessory. Light pine works well if your hair is blonde, but brunettes might want to go for the walnut look. Palettes also say a lot about you and your approach to painting. Do you use disposable paper palettes? You might want to rethink this approach, which can cheapen your image. The turpentine smell is also a key element to attracting curators and gallery owners, particularly if the dirty rag is tucked into your shirt pocket like a handkerchief. Dress up for opening receptions, so they know that you clean up well. To complete the image, make disparaging remarks about other mediums because, as we all know, painting is the only real art form. Naked is OK. If you really must dress for the occasion, make sure that you are unrecognizable except for your tattoos. You paid good money to get those and, by gum, you should show them. Wear your performance costume in real life and film yourself getting fired from your job at the IHOP. Casual wear is whatever happens to be around you within a five foot circle at the time. Do not wear anything that has been tested on an animal or was ever actually part of an animal. Do not wear makeup unless it's over your entire body. Do not wear anything that will get you arrested. I don't go into fabric stores as often as I used to because my fabric stash is large enough to cover the entire population of Rhode Island, although I'm trying to winnow it down to Delaware size. I still venture into the stores once in a while to buy things like thread and batting, but every time I go in, I dread the usual question, "What are you making?". Around here, the clerks are used to hearing about costumes for school plays and baby quilts with duckies or bunnies. They are not used to customers who make conceptual fiber art. Here's an actual conversation. Clerk- What are you making? Me- I'm making a quilt. Clerk- What size bed is it for? Me- The quilt is an inch and a quarter wide by seventy yards long. Clerk- Can you do that? Me- It's for a supermodel. Me- Actually, I'm going to knit the quilt on giant knitting needles, like yarn. Clerk- Where are you going to get giant knitting needles? Me- I'm going to make them out of foam pool noodles and toilet flanges. Clerk- How are you going to put all that on a bed? 10. You were planning to go on a starvation diet anyway. 9. You thought about being an actor, but wanted more rejection. 8. You look good in a beret. 7. You wouldn't be able to pass a pre-employment drug screening. 6. You've always dreamed of living in a rat-infested loft with no heat and a clogged toilet. 5. The only other career alternative was working for your mother-in-law cleaning up crime scenes. 4. You don't have to presort the laundry because all of your clothes are black. 3. You took three years of Artspeak in high school. 2. You can behave any way you want in public and call it performance art. 1. You can paint nudes. You can even paint on nudes.